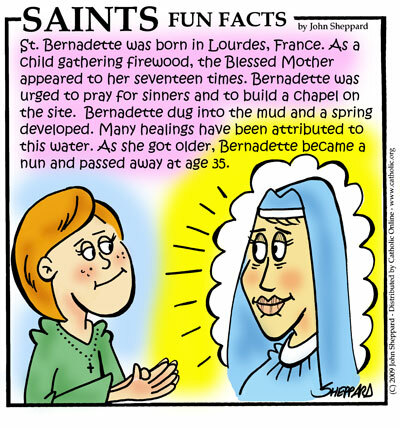 St. Bede or the Venerable Bede (673–735), was a monk and an early historian of the Catholic Church in England. He was a member of the Northumbrian Monasteries where he spent a great deal of time at Jarrow with its large library. He is well known as an author and scholar, whose best-known work, Historia ecclesiastica gentis Anglorum (The Ecclesiastical History of the English People) gained him the title "The father of English History ". Bede became respectfully known as Venerable Bede soon after his death, but this was not linked to consideration for sainthood by the Church. Bede himself said he was born in 673 and on the lands of the monastery of Wearmouth. At age seven he was presented by his family to the Abbot of Wearmouth, Benedict Biscop, to be educated. Bede was ordained a deacon when he was nineteen and at age thirty he was ordained a priest. While he was active in his community Bede found study, writing and teaching his favourite activities. He learnt Latin because that was the language of the Bible and other books in the monastery library. His teaching would have been very basic and his opinions were very conventional. Bede wrote many scientific, historical and theological works in his time. Many were copied and used by other monasteries in England and Western Europe One of the most valuable and important sources on Anglo Saxon history is Bede's Ecclesiastical History of the English Nation. The Ecclesiastical History contains 800 years of the history of England from the time of Caesar to the date of its completion (731). The last chapter is about Bede himself. The Venerable Bede died in 735 and was buried in Jarrow, although his remains were later moved to Durham Cathedral, where his tomb can be seen today. He was made a saint in 1899, as well as a Doctor of the Church, the only English man to hold that title. Oscar Romero (15/09/17 - 24/03/80) was a prominent Catholic priest and Archbishop in El Salvador during the 60s and 70s. After witnessing numerous violations of human rights he became a spokesperson for the poor and for victims of terrorism by the government of El Salvador. This led to numerous conflicts of opinion, both with the reigning government in El Salvador and with the Catholic Church. After speaking out against American military support for the government of El Salvador, Archbishop Romero was assasinated during a celebration of Mass in his cathedral.